French President Emmanuel Macron gives a speech in the northern port of Calais on Jan. 16, 2018, vowing that France will not allow another migrant camp like the infamous "Jungle" to spring up in the city. France is set to demand that Britain pay more to deal with the ongoing migrant crisis around the port of Calais, the main gateway from the European mainland to the UK. French President Emmanuel Macron visited the northern town Tuesday, where he met migrants at a local shelter, and praised the commitment of the police in a speech to local officers. "Under no circumstances will we allow illegal networks to emerge or develop here. Under no circumstances will we let another jungle camp appear here, or any other illegal occupation of land," he said, criticizing those who accuse the police of abuses against the migrants. Macron is expected to unveil new immigration policies in the coming weeks. Official figures this week showed a record number of asylum applications in 2017, exceeding 100,000 people. 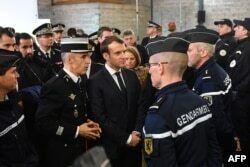 French President Emmanuel Macron (C) meets gendarmerie and police forces during his visit in the French northern city of Calais Jan. 16, 2018. Currently, British border controls are hosted in Calais under an agreement between Britain and France. Macron is due to travel to London Thursday for talks with Prime Minister Theresa May and is expected to demand Britain accept more asylum seekers and pay more toward policing the border. Hundreds of asylum seekers, mainly from Africa and the Middle East, are living in dire conditions in makeshift camps around Calais. The roads leading to the port are lined with rows of razor wire fences, but the migrants regularly scale the barriers and attempt to hide in trucks and cars heading across the English Channel. Migrants and volunteers accuse police of routine violence. One 22-year-old Afghan refugee, who has been in Calais for three weeks, said authorities regularly raid the camps. "When the police stop us, they hit us, they beat us. And when we sleep at night, they take away our tents, they tear them, they gas us, and there's nothing we can do." At its peak, up to 10,000 migrants lived in a sprawling camp known as ‘the jungle" just outside Calais. Former president Francois Hollande sent in bulldozers in 2016, and his successor, Macron, has taken a tougher line, insisting that migrants are bussed away from Calais to processing centers where their asylum status can be assessed. 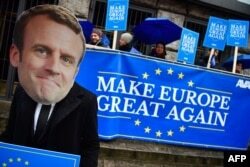 Activists of the Avaaz civic organization wear a mask of French President Emmanuel Macron and hold up posters and a banner reading "Make Europe Great Again." Many migrant charities refused to meet Macron during his visit to Calais, in protest of the crackdown. "Now there really is an incomprehensible step backwards, and it can be qualified as harassment," said Jean-Claude Lenoir, head of the migrant charity, Salam. Critics say the French and British governments are failing to address the factors that drive migrants to Calais. ​"Particularly the fact that some people have family links in the U.K., or they have other reasons behind their willingness to go to the U.K. For example, they believe that there are more integration prospects, or they have language skills that would work better in the U.K. Calais is a symptom, it’s an example of how the U.K. is shirking their responsibilities," Maria Serrano from Amnesty International told VOA in an interview. Britain says it has a rigorous asylum process and insists that it is one of the biggest global donors to refugee aid programs.